A triumphant President-elect Donald Trump celebrated Thursday the sealing of a deal with air-conditioning manufacturer Carrier that would keep about 1,100 jobs in the United States, halting the company’s planned move of its Indianapolis plant to Mexico. “Companies are not going to leave the United States anymore without consequences. It’s not gonna happen,” he vowed, citing plans for his incoming administration to lower taxes and cut regulations. 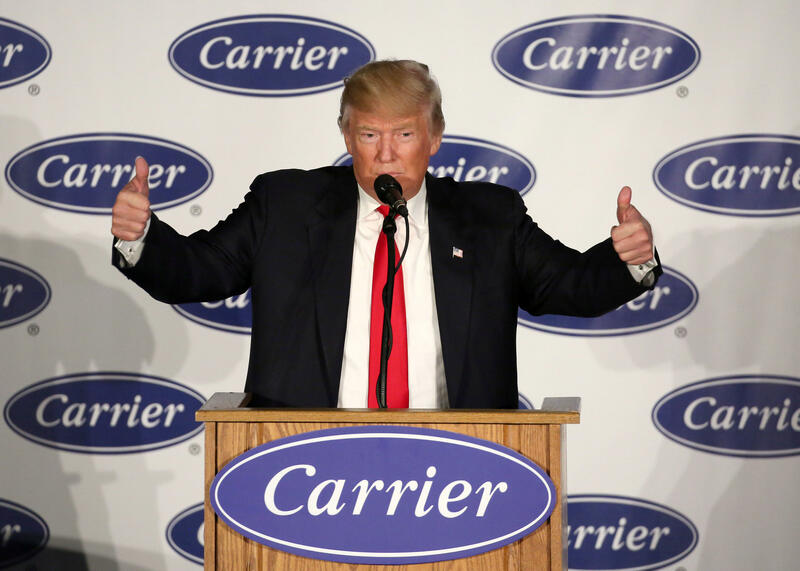 Carrier, in exchange for keeping its factory in the state, agreed to economic incentives negotiated by Vice President-elect Mike Pence (also Indiana’s governor): tax breaks of at least $700,000 a year over the next decade. During the campaign, Mr. Trump had promised for months that he would hit Carrier with massive tariffs unless it kept its Indianapolis plant up and running. He vowed to ensure those manufacturing jobs stayed in the state. But in his retelling, the president-elect seemed astonished at the way his campaign promise was received by workers at the plant. He recalled watching a network news piece about Carrier which featured a worker who didn’t believe that his job was going away because Mr. Trump had promised it wasn’t. Mr. Trump began his speech in Indiana -- his first public pronouncement since his Election Night victory address -- touting his election victories in the state during the primary and general election races. “I got involved because of the love affair I’ve had -- this has been a very special state to us,” he said. He went on to note that some people didn’t consider it very “presidential” to pick up the phone and call executives at the company, but Mr. Trump said he did it anyway. Mr. Trump and Vice President-elect Mike Pence toured the manufacturing plant ahead of the speech. Pence introduced the president-elect at the Carrier factory, praising the company’s decision to stay in the U.S. to the “leadership” and “initiative” of Mr. Trump. Some have publicly criticized the implications of the deal, including Vermont Sen. Bernie Sanders, who ran as a candidate in the Democratic presidential primary race. “He has signaled to every corporation in America that they can threaten to offshore jobs in exchange for business-friendly tax benefits and incentives,” Sanders wrote in a Washington Post op-ed Thursday. The White House weighed in as well, just as Mr. Trump publicly touted the deal. “I’m not criticizing it at all,” White House press secretary Josh Earnest told reporters, but noted that President Obama had set a high bar on manufacturing operations. Earnest said the president-elect would have to make 804 more deals like Carrier to equal the manufacturing jobs created under Mr. Obama’s watch. Mr. Trump has hinted that a deal was imminent since the Thanksgiving holiday, saying in tweets that he was “MAKING PROGRESS” towards an arrangement with Carrier.